Being a runner Foam Roller has became my best friend. Anyone who is using it knows the benefits of foam roller and how amazing it feels and of course painful at the same time. Hence the motto: No Pain, No Gain! – Body Awareness – you are more aware when something doesn’t feel quite right! – Body relaxation – one of the main reasons I continue to use foam roller during my pregnancy. I continue to use foam roller during my pregnancy. Even at this late stage of pregnancy (39 weeks today though with more care due to Relaxin Hormone). It really helps me with sore muscles especially legs. I think that is why I don’t suffer that much from cramps in the legs, calves and water retention. I use foam roller either first things in the morning (warm from bed and after little warm up session), after a bath or shower, or of course after training. Great for posture and relieving upper back muscles tension (you know growing breasts pulling you down and ruin your posture!). Also opens your chest, which means more oxygen supply. I did stop doing this massage after 6 months into pregnancy. Bigger bump meant I was too heavy and it didn’t feel good or safe for me to continue. Does what is says. Continue doing until this late stage of pregnancy. Promotes blood flow and relieving muscles tension. One I really recommend and love doing. With continuously weight gain calves do get a battering. Continue doing at this late stage of pregnancy. Only did this massage type until 5 months pregnant. Became too uncomfortable for me to continue due to growing bump. Just didn’t feel right or safe. Great for tight muscles. Also promotes blood flow and helps with water retention. Though do with care, growing bump (nearly touching the floor!). Only do it if you feel really safe. I only do it if I am not too tired and have the confidence that my arms with support my weight. Relieving tension in the upper thigh. I stopped doing this massage after 6 months. Became too heavy and didn’t want to put more pressure on my hip/pelvis. Improves blood circulation to the legs, helps with water retention and of course releases tight gluteal muscles (and I find it forms nice bum :)). I continue to do it. I sometime also use the blue ball (see picture below). It does have several benefits. First squatting, you can go really deep down which improves your leg strength (important to carry all the extra weight during pregnancy). Second gentle back massage, depending how deep you go from the upper to lower back. I also found it help me with the posture and opening my chest for better breathing. 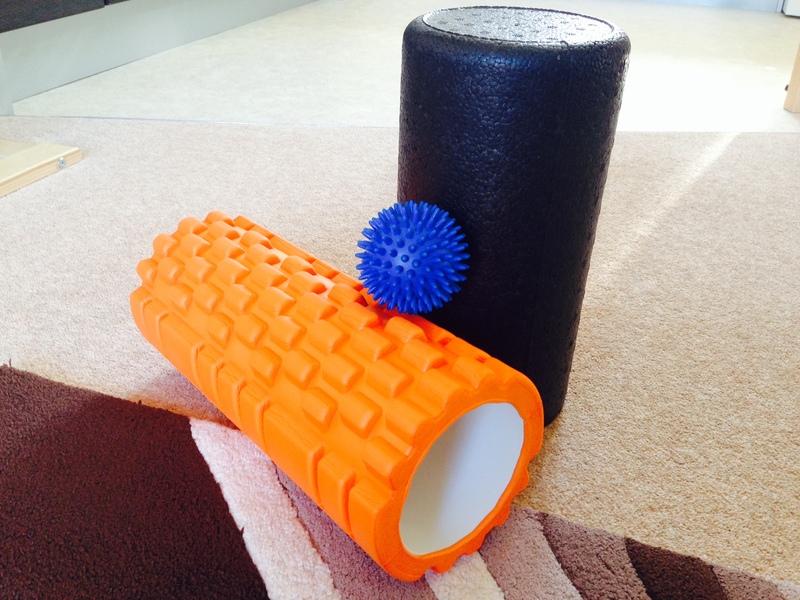 You can find loads of videos on YouTube on how to perform each foam roller massage. Important is that your muscles are warm, you feel confident and have the strength to hold your own weight (which can be tricky with ever so growing bump and weight gain). Happy Foam Rolling! Be safe, be healthy! P.S. I prefer the orange foam roller. It gets really deep into the muscles.